From the Department of Radiology (D.C.S., M.S.L. ), Asan Medical Center, University of Ulsan, College of Medicine; the Department of Radiology (H.B.S. ), First Affiliated Hospital of Hanjing Medical University; the Department of Medical Engineering (S.S.P. ), Seoul Health College; the Department of Radiology (H.Y.C. ), College of Medicine Ewha Womans University. BACKGROUND AND PURPOSE: We have noted that glue-Lipiodol mixtures harden prematurely in the catheter during embolization of brain arteriovenous malformations. However, we observed that hardening of this embolic material does not occur when tungsten powder is added to the glue mixture. In order to clarify the effect of tungsten powder on the glue mixture, we evaluated the reaction time and hardness of the glue mixture in vitro after the addition of tungsten powder. We also measured the pH of the tungsten solution. METHODS: Six lots of Lipiodol and three lots of Histoacryl Blue were mixed in a 5-cc bottle with a 50% to 25% glue concentration (glue:Lipiodol = 1:1 to 1:3) and this mixture was observed for 2 weeks. The hardness of the polymerized glue mixture was categorized as liquid, gel, semi-solid, or solid. Various series of experiments were performed after the addition of tungsten powder (0.2 g) and blood (a drop) into the glue mixture. We also separately mixed tungsten and tantalum powder in tubes, each with 5 mL of distilled water, and then measured the pH of these three times. The mixed amounts of tungsten and tantalum ranged from 0.1 to 0.5 mg. RESULTS: In a 50% glue concentration, the glue mixture turned into a solid cast within 48 hours. In a 25% concentration, the glue mixture turned into gel within 24 hours. The casts became solid in the 50% and gelled in the 25% concentration, and solid or gel in 28% and 33% glue mixture concentrations. The addition of tungsten powder to 50% and 25% glue mixture concentrations caused the glue mixtures to remain in a liquid state for 2 weeks regardless of the Lipiodol products used. Measurement of acidity achieved using a pH meter in 5 cc of distilled water with tungsten powder (0.1 to 0.5 g) revealed a change of pH from 3.5 to 2.6 according to the amount of tungsten added. Tantalum revealed weak acidity, with a pH range from 6.4 to 5.7. The addition of blood immediately caused the mixture to become solid in 50% and semi-solid in 25% glue concentrations. CONCLUSION: The reaction time of the glue mixture differed according to the lot number of the Lipiodol. The addition of tungsten powder appeared to prevent premature cast formation by decreasing the pH with a mechanism similar to that of adding acetic acid. N-butyl-2-cyanoacrylate (NBCA [Histoacryl or Avacryl]) is widely used as an embolic agent in the treatment of arteriovenous malformations since the use of isobutyl 2-cyanoacrylate (IBCA) has been discontinued (1). Cyanoacrylate almost immediately polymerizes upon contact with ionic fluids such as blood or with vascular endothelium. Modification of the polymerization process is required to allow for safe injection through a microcatheter. Cromwell et al (2) added Pantopaque (iophendylate) and Speigel et al (3) added acetic acid in order to prolong the polymerization time of IBCA in addition to providing some opacification. Premature cast formation of glue mixtures can occur during glue preparation (4, 5). This occurs in a catheter during injection of glue in patients with brain arteriovenous malformations (AVMs). Incomplete injection can lead to insufficient glue penetration into the nidus or even a dangerous situation because of the unexpected timing of the glue cast formation. We empirically added tungsten into a glue mixture without a prior understanding of its physical or chemical characteristics. We incidentally found that the addition of metal powder (tungsten or tantalum powder) seemed to change the characteristics of the glue mixture (6). This reaction raised two questions: 1) Does the glue mixture respond differently according to different lot numbers of glue or Lipiodol products? And 2) How does tungsten powder delay polymerization time irrespective of the lot number of the product? Consequently, we designed an in vitro study to attempt to answer these questions. Six lots (A, B, C, D, E, and F) of Lipiodol (Laboratoire Guerbet, Cedex, France) and three lots (a, b, and c) of Histoacryl Blue (B. Brown, Melsungen, Germany) were used in these experiments. 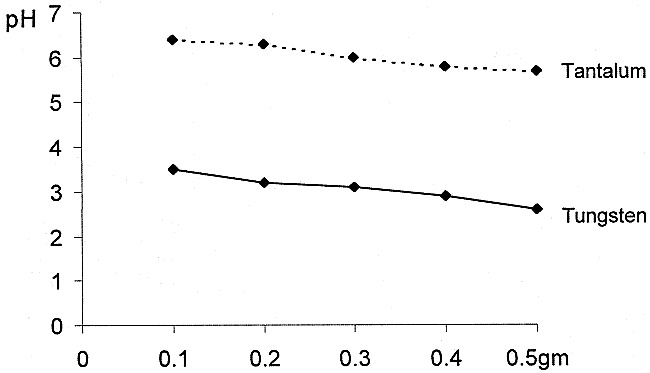 Histoacryl and Lipiodol were mixed in a 5-cc bottle in ratios of 1:1 (50%), 1:2 (33%), 2:5 (28%), and 1:3 (25%), and were examined after 5, 10, 20, 30, and 40 minutes, again after 1, 2, 24, and 48 hours, and again 1 and 2 weeks later. Hardness of the polymerized glue mixture was estimated in the liquid, gel, semi-solid, and solid states. The glue mixture was classified as liquid if it changed its shape when the bottle was tilted, as gel when it did not change its shape but when needle insertion was still smooth, as semi-solid when it was solidified but a needle could be inserted, and as solid when it was so hard that needle insertion was impossible. The same experiments were repeated after the addition of tungsten or tantalum powder (Laboratories Nycomed SA, Paris, France) or a drop of blood to the glue mixture. In order to measure the pH changes, 0.1, 0.2, 0.3, 0.4, and 0.5 g of tungsten was mixed in tubes with 5 mL distilled water, and pHs were measured with a pH meter three times for each tube. An average value was thus obtained. We measured the pH of acetic acid as a reference and of tantalum for comparison to tungsten. A drop of blood was mixed into the glue mixture in order to simulate cast formation in in vivo status and to assess the hardness of the cast. In 50% glue concentrations, the glue mixture, except in lots C and D, turned into solid casts within 48 hours (Table 1). In 25% glue concentrations, the glue mixture, except C and D, turned into gel within 24 hours (Table 2). The lots C and D with a 25% concentration were stable and remained liquid for 2 weeks. The casts became solid in 50% concentrations, gel in 25% concentrations, and solid or gel in the 28% and 33% glue mixture concentrations (Table 3). Among the glue products, the reaction of Histoacryl (c) was slower than that of the other products (a, b). There were, however, no significant differences in the reaction times among the Histoacryl products. The addition of tungsten to 50% and 25% glue mixture concentrations caused the glue mixture to remain in a liquid state, regardless of the Lipiodol product used, for up to 2 weeks. The addition of tungsten (0.1–0.5 g) to 5 cc of distilled water caused a pH change from 3.5 to 2.6 (Table 4). When blood was added to the glue mixture, the mixture immediately became solid in a 50% concentration and semi-solid in a 25% concentration. Our results demonstrated that the lot number of Lipiodol and Histoacryl could affect reaction times. In a 50% glue mixture concentration, two products, lots C and D, remained stable as a liquid for 48 hours. In a 25% glue mixture concentration, two products, lots C and D, remained stable as a liquid for 2 weeks. These results suggest that glue mixtures tend to harden into casts prematurely before being able to be used for embolization unless the stable product is used. The reason for the spontaneous polymerization of glue remains unclear. Apsimon et al (4) suggested that early polymerization is possibly attributable to a contaminant in Lipiodol and is potentiated by the Histoacryl ampule in which the actual volume has been reduced and some residue found. Our results demonstrate that the degree of premature polymerization was different according to the lot number of the Lipiodol and Histoacryl concentrations. When tungsten was added to the glue mixture, it remained stable as a liquid for 2 weeks irrespective of the Lipiodol lot. We speculated that some characteristic of tungsten affects the glue mixtures and inhibits polymerization because most glue mixture solutions without tungsten hardened into casts within 2 weeks. Because polymerization of glue is known to be delayed by the addition of acetic acid, we measured the pH of tungsten in distilled water and finally found that tungsten solution has a strong acidity. The pH change depended on the amount of tungsten. Based on our data, we believe that tungsten inhibits polymerization of the glue mixture by reducing the pH. Therefore, tungsten can be used to retard polymerization as well as for an opacifying agent in high glue concentrations. The effect of the glue mixture with tungsten differs from that without tungsten when used for embolization (6–8). Although the glue mixture and glue mixture with tungsten were able to be injected at the nidus of a brain AVM, a glue mixture with tungsten could be injected effectively at the pedicle of a brain AVM because the glue mixture with tungsten tended to reach the nidus through the pedicle (6). Therefore, the glue mixture with tungsten can be used at the pedicle when the pedicle aneurysm exists just in front of the nidus. However, the glue mixture with tungsten seemed able to penetrate the vein of a brain AVM more often than the glue mixture and it should be used very carefully during embolization of a brain AVM. Tantalum showed a similar but less efficient effect than tungsten as a retardant. Our observation with tantalum differed from a report by Brothers et al (1) who noted spontaneous polymerization in both NBCA and IBCA when in contact with tantalum, and recommended that tantalum mixtures of NBCA should be used or discarded within 15 minutes of preparation in order to avoid catheter blockage. Brothers et al (1) also mentioned that it is unlikely that tantalum speeds polymerization of the glue mixture when injected intraarterially. We cannot explain the seemingly opposite effects of the tantalum, but we suspect that the acidity of the metal powder differs depending upon the metal powder production process. Further studies are warranted in order to prove that the acidity of metal powder is directly responsible for the delayed or accelerated polymerization. The final status of the glue mixture was that it solidified in 50% glue mixture concentrations and became gel in 25% concentrations. Its hardness was of solid-to-gel consistency in 28% and 33% concentrations. Hardness of the glue mixture is an important factor for surgery. When the cast is too hard to cut, resection is difficult during surgery. Therefore, the glue mixture with less than a 28% glue concentration is recommended for preoperative embolization in order to avoid difficult resection during surgery. The reaction time of glue mixtures differed according to the lot number of the Lipiodol. Most glue mixtures did not remain liquid before use and turned into glue casts prematurely. When tungsten was added to the glue mixtures, they remained in a liquid state. The addition of tungsten seemed to prevent premature cast formation by decreasing the pH with a mechanisms similar to that of adding acetic acid. 1 This study was funded in part by a research grant from Korea Science and Engineering Foundation (981-0708-070-2). ↵2 Address reprint requests to Dae Chul Shuh, MD, Department of Radiology, Asan Medical Center, University of Ulsan, College of Medicine, 388-1, Poongnap-Dong, Songpa-Ku, Seoul 138-736, Korea. Accepted after revision January 24, 2000.